This sleek, ultra-light backpack protects you and your stuff from the less-fun forces of nature. Whether you're exploring the Amazonian lowlands, the Scottish Highlands, the Great Wall of China, or great bargains in Chinatown, your foes are the same: gravity and rain. This ultra light backpack—its sleek design packed with technical features—whips them both. 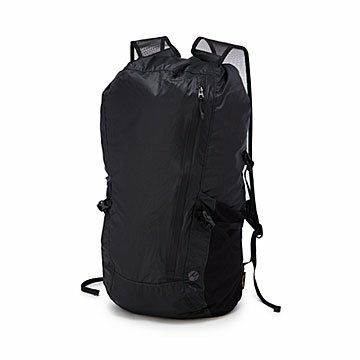 Created by travelers for travelers, it weighs just 5.5 ounces, with stabilized, reinforced, breathable shoulder straps that keep gravity from harshing your mellow. Rain can't get past the triple threat of waterproof surface, water-resistant sealing zipper, and dry bag-style roll top closure. This mighty bag also fights time (hard-wearing, puncture-proof Cordura® fabric gives it a long lifespan) and space (24-liter capacity, but squishes down so small you can stuff it in your pocket). We're sorry to report that it can neither cook nor translate from Urdu to English—though we suspect it knows how to order dinner in French. Designed in Boulder, Colorado. Made in China. I bought this for a trip to Antarctica. The small boats that take you to shore every day get you very wet with spray, so I used this for my SLR camera. It sat in the bottom of the boat in puddles and was perfectly dry inside. It was a life saver. I also have used in in the rain forest in Peru. I got caught in a complete downpour, and it never leaked at all. Now I use it for my daypack on all my trips because I don't ever need to worry about rain. The only downside is that it is more difficult to get into it through the rolltop, but that's what makes it so waterproof, so you can't have everything. The outside pockets and extra zipper pocket are really convenient. Bought this for our trip to Italy. Durable and plenty of space for towels, extra clothes, and bottles of wine. Packs up super portable. Great gift for my folks, they loved it and found it very useful on their adventure!